A beautiful, bright & white smile will help you smile confidently in those family photos. 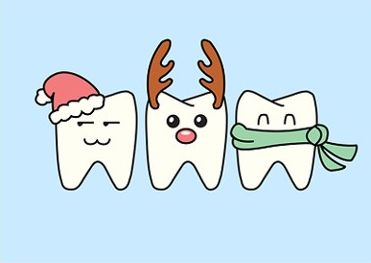 Here are the top 5 tips for keeping your teeth extra clean during Christmas Holidays. Please note, we purposely left out #1 which is eat right for whiter teeth. The holiday season is not the time for guilt. 2. Use the brush lightly on your teeth. There is a misconception that if you brush harder the teeth, you will cleanse them teeth better. Brush using circular movements, and by holding the brush at a 45 degree position against your gums. 3. Always clean your tongue. Make sure to clean your tongue thoroughly in order to remove all the harmful bacteria deposits and to obtain a fresh breath. There are several professional brushes that come with a tongue scraper. 4. Don?t use your teeth to open bottles or gifts with tear plastic covers. Make sure that you always have in handy a pair of scissors and bottle openers. Using your teeth for such purposes can break or chip them easily. 5. Chew on cinnamon flavored gum. Recent studies have shown that if you chew on cinnamon flavored gum the bacteria in your mouth will be significantly reduced. The main ingredient that helps doing this is called ?cinnamic aldehyde? (essential oil that fights against the production of bacteria in the oral cavity). « Is SLEEP a secret ingredient in reaching heart healthy weight goals?